Another suitable title for today's Daily Illuminator post: Some Things Never Change. In working on the Pocket Box Kickstarter campaign (now over $100,000! ), we spent a lot of time going through some of the company's oldest games and expansions. Time and again, we would find ourselves lost inside the catalogs, browsing through page after page and enjoying the company's history and the old sales text. 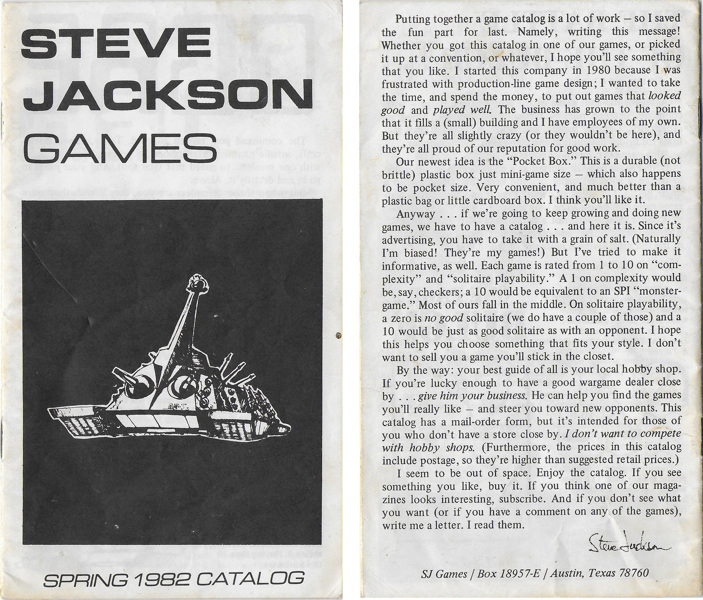 The back cover of one catalog, though, really captured our attention and Steve's words from 1982 are as true today as they were then. "Putting together a game catalog is a lot of work -- so I saved the fun part for last. Namely, writing this message! Whether you got this catalog in one of our games, or picked it up at a convention, or whatever, I hope you'll see something that you like. I started this company in 1980 because I was frustrated with production-line game design; I wanted to take the time, and spent the money, to put out games that looked good and played well. The business has grown to the point that it fills a (small) building and I have employees of my own. But they're all slightly crazy (or they wouldn't be here), and they're all proud of our reputation for good work. Our newest idea is the 'Pocket Box.' This is a durable (not brittle) plastic box just mini-game size -- which also happens to be pocket size. Very convenient, and much better than a plastic bag or little cardboard box. I think you'll like it. Anyway . . . if we're going to keep growing and doing new games, we have to have a catalog . . . and here it is. Since it's advertising, you have to take it with a grain of salt. (Naturally I'm biased! They're my games!) But I've tried to make it informative, as well. Each game is rated from 1 to 10 on 'complexity' and 'solitaire playability.' A 1 on complexity would be, say, checkers; a 10 would be equivalent to an SPI 'monster-game.' Most of ours fall in the middle. On solitaire playability, a zero is no good solitaire (we do have a couple of those) and a 10 would be just as good solitaire as with an opponent. I hope this helps you choose something that fits your style. I don't want to sell you a game you'll stick in the closet. I seem to be out of space. Enjoy the catalog. If you see something you like, buy it. If you think one of our magazines looks interesting, subscribe. And if you don't see what you want (or if you have a comment on any of the games), write me a letter. I read them." Are all a little bit crazy here at the office. Want to ensure that you buy only the games you'll play; games grow lonely when they sit unplayed. Would like you to visit your friendly local game store and let them know how much you appreciate them providing a place to find new games, new opponents, and to play games.